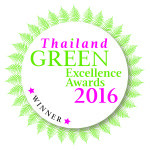 Andaman Discoveries has been awarded the winner of the 2016 Thailand Green Excellence award in the Community Based Tourism Category. We have now won this award in three categories, previously winning in the Volunteer and Tour operator category, proving that our organization is a well rounded and sustainable tourism operator. The criteria focused specifically on the community based tourism programs that we offer. They make sure that the tourism experience is being managed by the local communities to ensure an interactive and collaborative experience between Andaman Discoveries, the community based tourism group within the village and also the respectful guest. We also showed that the communities we work with receive a fair income that is spread evenly within the village to encourage solidarity and that the tourism activities within the village are preserving the local culture and environment. The criterion also looks at the guest experience. AD showed that the community based tourism activities immerse the guest in local culture by staying in a homestay and engaging interactively in activities that are lead by local guides. To make this even more positive for all parties, we provide extensive pre-departure information and also send an Andaman Discoveries translator with guests to allow for open communication between the homestay families and local guides. The environmental effects are also taken into consideration and we showed that the programs offered allow tourism to act as an incentive for communities to protect and preserve their surrounding environment. We are so happy to have won this award and thank all of our partners for their hard work and encouragement!